Yeah, but: It does exactly what it's meant to. The Long Version: Think Tanks's Glass Taxi is a backpack designed to hold a camera and long lens, with room for a small number of extras. There's no room for anything else, though, with only a small mesh pocket to hold accessories. The pouches on the side are tight to the side of the pack to securely hold a tripod or monopod, but do not stretch to hold a water bottle or have elastic to retain small items. Build quality is very good, easily matching or beating the construction of my various cases from Domke, Petrol, Manfrotto, and Crumpler. The self-locking zippers are a brilliant design feature, and they and all of the metal load-bearing hardware have a dulled finish that's understated and will wear well. The included tripod straps have a velcro section that mates with hidden velcro underneath the side lash points, holding the straps securely in place even when the snaps are undone. Think Tank also includes far more dividers than are shown in the photographs on their web page; there's certainly enough to use this backpack to carry a complete system of small lenses and accessories if you choose to. My typical load for this backpack is over 10Kg of camera, lenses, and tripod, but it carries it well. It doesn't counteract the effects of gravity, but during a six-hour shooting hike the pack never became an issue. Its long and narrow profile doesn't interfere with movement, it's easy to move through crowds or hand-carry on public transit, and it sits upright when it's put down. Comparing this pack to my other backpack is an extreme contrast: I love my Glass Taxi as much as I don't love the Lowepro Micro Trekker. I may have my bag under-loaded. Because it's designed to hold very large lenses, it's boxy and deep. This means that there's a lot of movement when a tripod is attached to the side of the bag. 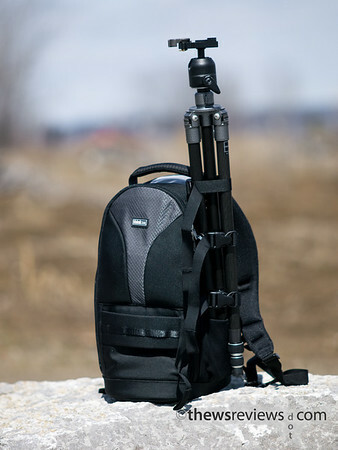 I've solved this by adding one of the monopod straps (which don't have the snap buckles of the tripod straps) to the carrying handle at the top of the bag. The only real flaw in the design of the pack comes in an unexpected way: insufficient velcro. Think Tank makes extensive and intelligent use of this material everywhere except for the small mesh accessories pocket on the inside of the lid/front panel. This is the only place to hold small items -- large ones won't fit in the flat pocket -- such as spare batteries or cards. However, when the bag is laid flat and the lid is completely opened to remove a secondary lens, the opening of this pouch is upside-down. There's only one small patch of velcro to secure this pocket, leaving plenty of room for the contents to slide out. I've solved this problem by keeping a second bag inside this pocket to hold my small items, but there's simply not enough room to spare for this to be an effective long-term option. Given the thoughtful design of the rest of the bag I have to assume that there's a good reason for this deficiency, but I don't see what it might be. I'm not sure if this is my favourite bag; my Domke F6 has a special place in my cupboard after it faithfully got me through a three-week world tour. But after a tragic purchasing decision, I've spent a lot of time looking for something better before I bought the Glass Taxi based on the strength of Internet reviews. I wish I hadn't wasted my time and money and had just bought this one at the very beginning. It is certainly a bag I am considering at the moment to carry a Nikkor 200-400 VR. Your point about the velcro on the pocket is familiar. I have a Think Tank Airport International (a brilliant bag) which has a similar design flaw - it has numerous zipped pockets in the lid. However, if you lay the bag down to get things out the zips are at the bottom of the pockets - so any items with weight such as batteries just fall out onto the floor! I have pointed this out to TT - let us hope they listen. Their bags are otherwise among the very best. "I have a D3 and with a 70-200 hood extended it fits, but the depth to hold the D3 is not good at all, you can get the bag closed but the top of my D3 is rammed right up into that stupid mesh pocket (which is useless for more than 1 reason) and the whole front of the bag offers no padding really so i am extremely fearful about damaging/banging the "head" of my D3. For anything but a D3 this is the perfect bag, but they advertise this bag is suitable for pro sized SLR and while it's 1/2 true it's really not true... and so the whole concept is a fail for me, the "big glass" bag that wont protect a big cam. Thumbs down Thinktank, 2/5 from me." I used it to carry the 200-400 around in but essentially the bag that comes with the 200-400 serves pretty much the same purpose. I did however use it as like a day pack for this setup in Egypt. 1 x D3 body always on my neck with one of the below 3 lenses on the camera at one time or another. 1 x 24-70 hood reversed when in pack, though this may or may not have been necessary. 1 x 17-35 hood reversedwhen in pack, though this may or may not have been necessary. But alas Think Tank have really failed in my eyes for anyone with a pro sized SLR. What a shame for me that i am in Thailand and so putting it in eBay is not such a realistic option to rid myself of it. Seeing as you love gear i'll rave on a little bit. I bought a Domke F2 waxwear bag. Love it, Love It, It is a tardis! i could have gotten the SB-900 in the front pocket but it would have made the bag a bit "over stuffed looking" and i did not want anyone to drop it on a scale, so i packed my SB-900 and my cokin setup and some grads into my luggage and carried nearly my whole rig on the plane. All i wanna know is do Domke make a bag just slightly bigger, if so i'll buy that in a heartbeat. I use the Glass Taxi with the D3s and the Nikon 300 f/2.8 VR attached with hood reverse, and it fits perfectly. If I use the bag with the Nikon 200-400mm VR II, there will be no space for the D3s, but I will then attach to the front rail the Chimp cage for the body. I like the small size.